Ratings for week 1 on flat are complete. Drivers - Start your entries. 15lbs for winning a 0-90 harsh man! You beat a huge field. You beat a 90 and a bunch of mid 80 rated horses. The horse has won three of it's last five starts. The clincher - One of those wins was a Group 1 (Restricted yes - but a big money race). I'm being generous leaving you eligible for 0-90. I was hoping this wouldn't be an issue. Pipe dream actually. Last season I took my time handicapping the last week of racing. I put off the very last day for forever. When I finally got around to it the season turned over and the races were unavailable to handicap. I have been carefully watching for horses from that last day so I could adjust the ratings to what they should be. Stu has Paddys Women that ran this week. Paddy won his last race of which I did not handicap. Paddy improved slightly this week. That is why Paddy is up 9 points this week. I apologize profusely for being lazy with the last day of last seasons races. I truly thought whenever I got to it it would be there for me to handicap. I was wrong. Handicapping 35+ races a week and clicking almost every horse's form each week can drive a man batty. Fair comment, but maybe if we were aware that you were unable to handicap the final week, I would of run Hither Green in a G1, she would of finished mid/end pack and not been crucified fto this season. obviously the same can be said about Paddy's Women. Tough job I know, but, 3-5lbs in the competitive world of 70's, 80', 90's can make all the difference. It hurts my brain when i try to imagine how much work goes into setting the ratings. I tried just reviewing last weeks flats to put together my tips for this week and by the last day of racing i'd all but given up and started guessing. Thanks. It takes around three hours three nights a week. I open the three folders I use for files and the kit. I open TOM and the race video. 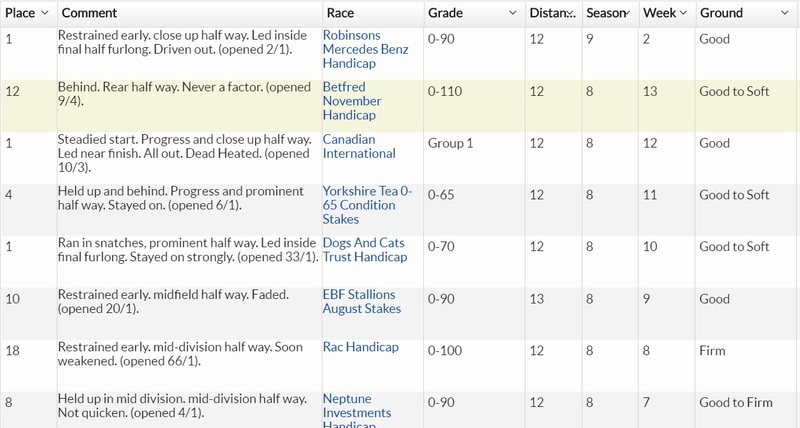 I determine the rating for the race and then click each horse's form by finishing position to judge them mostly by their last race and what they did today to come up with a rating. I enter links for the videos to end it off. I play some music to help out the process and make it go quicker. By day three I can't wait to be done with it. By week thirteen someone's going to pay. Thank you very much Sirius! We can't say that often enough! Without you we wouldn't have a league! Great work! Thanks both of you. I like handicapping real and game horses. The least coveted role in the league is hard to fill so my stability at the position makes the league run a lot smoother I hope. Week 3 flat ratings are complete.